I can’t remember what this was nominated for. I’ll have to check. Surely, it couldn’t be the acting. The acting was so appalling at the start of the film, it even seemed like Ewan McGregor was struggling with a Scottish accent, which given that he is a Scot, is shocking. It wasn’t the accent. It was the stiltedness of it all, which gets explained later, but just seemed bad at the start. Somehow (given that I’m aware that films are shot non-sequencially), the acting overall seemed to improve as the film went on. 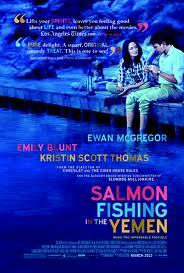 Ewan McGregor is Dr Alfred Jones, a socially inept bureaucrat in the department of fisheries and wildlife in the UK who is approached by a wealthy businessman to set up Salmon flyfishing in one of the rivers in the Yemen. It seems ridiculous to him given the different climates and various other factors, but when the British government (represented by the wonderfully fouth-mouthed Kristen Scott Thomas) needs a good news story from the Middle East, all stops are pulled out to get the project happening. It’s actually not a bad little story. Cute, a bit quirky, with a bit of drama and some decent sub-plots. It just didn’t quite work for me.